I started the day meeting Tom Zinn for breakfast at Panera while the girls slept in. Delicious breakfast sandwich on ciabatta bread. Yum! JFK's grave is visited by millions each year. Supposedly when he visited Arlington House and saw the view of DC he commented that he could stay there forever, a darkly prophetic comment. 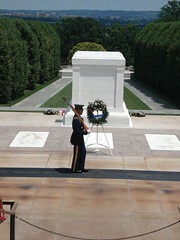 We saw many headstones of famous and not so famous people. 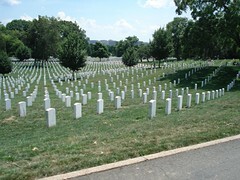 Over 300,000 are buried here and on average over a dozen funerals take place here very day. The changing of the guard is absolutely INCREDIBLE! To watch the dedication of these soldiers, the precision, the complete commitment to their duty is very inspiring. I filmed it on my digital camera. If it came out I'll post it to YouTube. The view of the city from Robert E. Lee's Arlington House is nothing less than fantastic! However, it was sad to hear that this home was essentially confiscated from his family for the cemetery by those who hated him for leading the Confederate army. It took the Supreme court to grant proper compensation to his heirs. After leaving the national cemetery we stopped in downtown to pick up a few souvenirs before heading to Baltimore for supper. Believe it or not I got a parking ticket! I still had 4 minutes left on the meter but apparently I parked in an area that doesn't allow parking during rush hour. You have to pay CLOSE attention to the parking signs. We drove to Baltimore to eat on the Inner Harbor. My father-in-law, Dale Chapman, is from Baltimore and we really wanted to connect with his old stomping grounds. The Inner Harbor is hard to describe. It's cutting edge modern mixed with old-world charm. After supper we rented a paddle-boat and spent a little time on the water before heading back. We started with breakfast at Panera. I wanted Lori and the girls to get to experience their excellent fare. We split into two groups and headed for the monuments. Meliheh took the girls in my van and I rode with Tom. 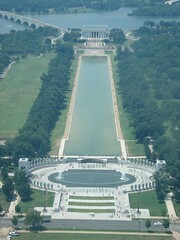 The girls got a great parking place but Tom and I ended up parking over a mile away from the Lincoln Memorial! But it was a nice walk on a very pretty day - and we got bonus points for getting to walk through the FDR memorial, which a lot of folks miss. We met our crew at the Lincoln Memorial after getting to see the Korean Memorial. We spent a good bit of time reading the quotes. I was especially moved by Lincoln's statement that both sides, North and South, read from the same Bible and prayed to the same God. Very poignant words. We then headed to see the Vietnam Wall. It is as moving as people say it is. It starts out small then grows huge then goes small again, kind of how the war started small, grew exponentially and then shrank into oblivion. There were lots of folks, some making rubbings of names, others leaving momentos, etc. Very moving. Then we headed to the Washington Monument for our appointed time. We headed to the top and took in the majestic view of the panorama. Meliheh had gotten some extra tickets and invited a couple of friends who had never visited. It's amazing how many people live in this city and don't take advantage of all it has to offer. It was great to get to experience it with them. We parted ways with Meliheh and company after the Washington monument. We drove around until we found a place to get a good picture of the Capital with the $50 bill. 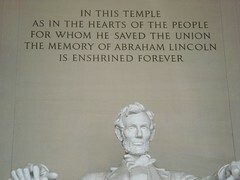 (I got the Lincoln memorial with the $5 bill earlier.) We then headed to get a bite to eat and back to the hotel. Even though we had gotten a hotel with a pool, we hadn't slowed down enough to even go swimming yet so the girls decided to go swimming while Lori and I made our way back into the city. I wanted to attend worship services at National Community Church which is pastored by Mark Batterson whose blog I read regularly. 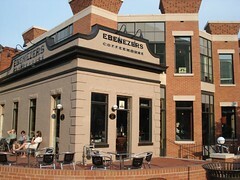 They have Saturday evening services at Ebenezer's Coffee House which is owned by NCC. We got there late but really enjoyed the service. The funny thing is I was hoping to get to hear Mark preach, but NCC is a part of the One Prayer and they had a video of Dino Rizzo preaching. For those who don't know, Dino pastors Healing Place Church in Baton Rouge! 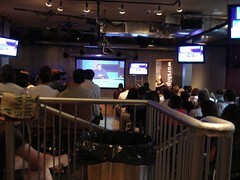 So we drove over 1,100 miles to hear a pastor from my own back yard! After church Lori and I walked around Union Station before heading back to the hotel. We met some nice ladies on the metro from North Carolina. At least I thought they were nice until they broke the news to me that LSU had lost to NC in the College World Series! But really they were nice ... sort of! We're having a magnificent time! (I'm running out of adjectives, so I'll use exclamation points!!!) Tomorrow we're headed to church with Meliheh and a lazy afternoon in the city before heading to Philadelphia and then on to New York. Memories, memories, memories! Thanks to everyone who helped make this possible!